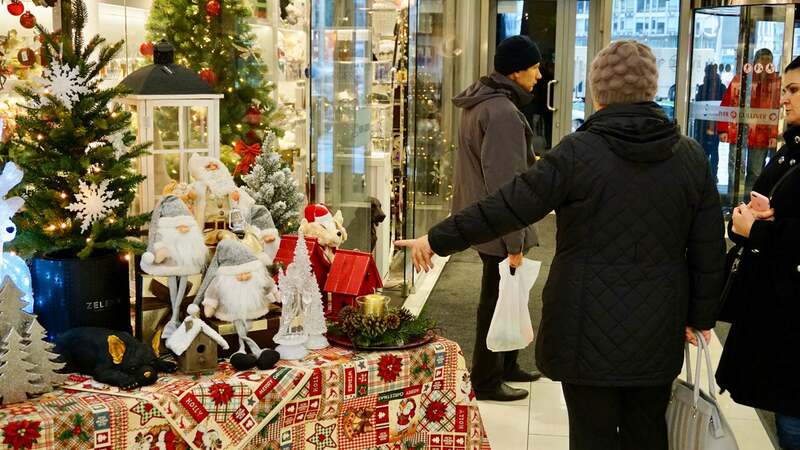 KYIV, Ukraine—The weekend after Thanksgiving, shopping malls across Ukraine touted special Black Friday sales. 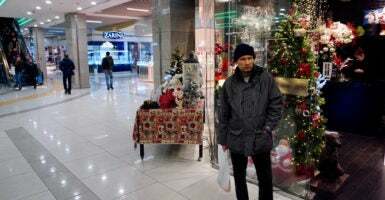 Of course, Ukrainians don’t celebrate Thanksgiving (not yet, at least), so there was no post-holiday food hangover to slow down shoppers’ clip as they flooded the malls and shopping centers. Nevertheless, just like in the United States, the Ukrainian holiday season kicked into full gear that weekend. On the streets and storefronts in the capital city of Kyiv, the Christmas trees, lights, and decorations are up. “The Nutcracker” ballet is back on the playbill at the National Opera of Ukraine. And in the coffee shops and cafes, the amount of Christmas music—including American staples like Burl Ives’ “A Holly Jolly Christmas”—is ratcheting up. But there’s a key change to the holiday lineup this year in Ukraine, which makes the season feel even more indistinguishable from what one might find in any typical American city. The Gregorian calendar’s Dec. 25 Christmas is now a public holiday. Ukraine’s parliament, the Verkhovna Rada, passed a law on Nov. 16 to that effect, and with the stroke of a pen on Wednesday, Ukrainian President Petro Poroshenko made it official. Previously, only Orthodox Christmas—celebrated on Jan. 7, according to the Julian calendar—was an official holiday in Ukraine. According to the new law, both the Julian and Gregorian calendar Christmases will now be official holidays. “I’ve been waiting for Dec. 25th to become a holiday because I’m from western Ukraine, and we have lots of Catholic people,” Sophie Shuliakovska, a 21-year-old public relations manager in Kyiv, told The Daily Signal. “In my mind, it was kind of a discrimination against them that Orthodox people have holidays on Christmas while Catholics didn’t,” Shuliakovska said. According to a 2016 poll by the Razumkov Center, a Kyiv-based think tank, Catholics and Protestants comprise no more than 3 percent of Ukraine’s population of 42 million. However, Ukraine’s Greek Byzantine Church is mulling a proposal to adopt the Gregorian calendar, which would boost the share of Ukrainians celebrating Christmas on Dec. 25 to about 9 percent. Champions of the new Christmas holiday painted it as a respectful nod toward Ukraine’s Catholic and Protestant minorities. Others say the move was really the latest chapter in Ukraine’s ongoing cultural divorce from Russia, a longtime trend in Ukraine that gained steam after the 2014 revolution overthrew the country’s then-President Viktor Yanukovych—a Kremlin ally who fled to Russia after his ouster. The Julian and Gregorian calendars split in the 16th century, with the more accurate Gregorian calendar adopted in predominantly Catholic and Protestant Western European societies. The Julian calendar, however, remained the standard among the national churches in Eastern Orthodox countries. Today, the overwhelming majority of Ukrainians and Russians still celebrate Christmas on Jan. 7. A visit to Ukraine today is a chance to witness the birth of a democracy—not just in government halls but across all spheres of society. Since the 2014 revolution, Ukraine’s politics, military, and economy have, for the most part, become less corrupt and more in line with Western democratic norms. Notably, Ukrainian civil society has flourished since the revolution, a shift driven by Western-minded millennials working to change their country in ways spanning the gamut from founding anti-corruption watchdog groups to supporting independent journalism. “Ukrainian millennials do great work,” Shuliakovska, the 21-year-old public relations manager, said. Still, post-revolution development has been frustratingly slow and halting. Many pro-democracy, anti-corruption activists in Ukraine, as well as the country’s Western allies, say more needs to be done. On Dec. 1, for example, the European Union announced it was withholding the final 600 million-euro tranche of a larger 1.8 billion-euro financial assistance package to Ukraine due to the country’s failure to fulfill all of the reform measures required by the EU for continued investment. “From Ukraine’s side, reinforcing the reform momentum and resisting internal pressures for policy reversals on important reforms will be crucial, particularly over the coming months,” the European Commission, the EU’s legislative institution, said in a Dec. 1 statement posted to its website. After the 2014 revolution, Russia invaded and illegally seized Ukraine’s Crimean Peninsula and then launched a proxy war in eastern Ukraine. Russia and Ukraine have been in a de facto state of war for almost four years, and more than 10,200 Ukrainians have so far died in the fighting. The war is not over. On average, one Ukrainian soldier still dies in combat every three days. 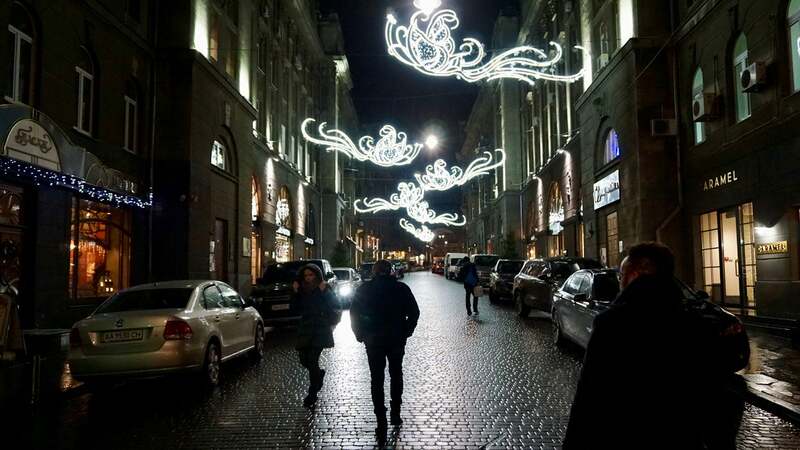 Christmas lights line a street in central Kyiv. In the weeks and months following the revolution, many feared that Russia’s proxy war in eastern Ukraine was the opening salvo of a full-on invasion. On their own accord, many patriotic young Ukrainians went off to war with the regular army or in volunteer battalions, or built volunteer movements to ferry supplies out to the front lines. As the Ukrainian war goes into its fifth calendar year, Ukrainian civilian volunteers (the overwhelming majority of whom are millennials) still spearhead grassroots defense initiatives to compensate for government shortfalls in areas like combat medical care, explosive ordnance disposal, and even drone operations to spot artillery fire. That’s a lot of talent and patriotism that could be put to use in other ways for a country that has no shortage of challenges. Resultantly, Ukraine’s grass-roots war effort has siphoned energy away from post-revolution reforms. Polls suggest that the majority of Ukrainians perceive corruption and economic woes to be more pressing concerns than the war. After all, life has been tough in Ukraine since the 2014 revolution. In 2015, 74 percent of Ukrainians said their life had gotten worse in the past year, according to the Kyiv-based Ilko Kucheriv Democratic Initiatives Foundation think tank. In 2016, that number remained pegged at 73 percent. Yet, even while fighting a war and weathering an economic crisis, Ukraine’s post-revolution government has done more to fight corruption and democratize since 2014 than what was achieved during the preceding 23 years of post-Soviet independence. Ukrainian culture, too, has de-Russified at a faster clip since 2014 than in all the preceding years of independence. In August this year, Ukrainian officials announced the removal of all 1,320 statues of Soviet leader Vladimir I. Lenin. Granted, it took more than 26 years after the Soviet Union’s collapse to do so. In 2015, Poroshenko passed a series of decommunization laws, outlawing symbols of the Soviet Union such as the hammer and sickle flag, the Soviet national anthem, and statues of Soviet luminaries like Lenin. “Today, as Russian imperial revanchists forget the bitter lessons of war and restart the conflict in the very heart of Europe … Ukraine is on fire again,” Chairman of the Verkhovna Rada Andriy Parubiy said on May 8, 2016, while commemorating the end of World War II. Ukraine’s cultural divorce from Russia did not begin in 2014, or with the 2015 decommunization laws. The country has been incrementally adopting Western cultural traditions since the Soviet collapse in 1991. Ukrainian weddings, for example, look a lot different today than they did during the Soviet era. Cake-cutting ceremonies, first dances, first songs, and the bouquet toss have all become part and parcel of Ukrainian weddings since 1991—a result, many say, of the popularity of American movies in the post-Soviet era. Holidays are another symbol of Ukraine’s pro-Western cultural pivot. This year, Dec. 25 will be a national holiday in Ukraine. In 2016, Ukraine introduced the Day of the Defender holiday on Oct. 14, ditching the longstanding Feb. 23 Soviet Motherland Defenders’ Day, also known as Soviet Army Day (which is still celebrated in Russia). 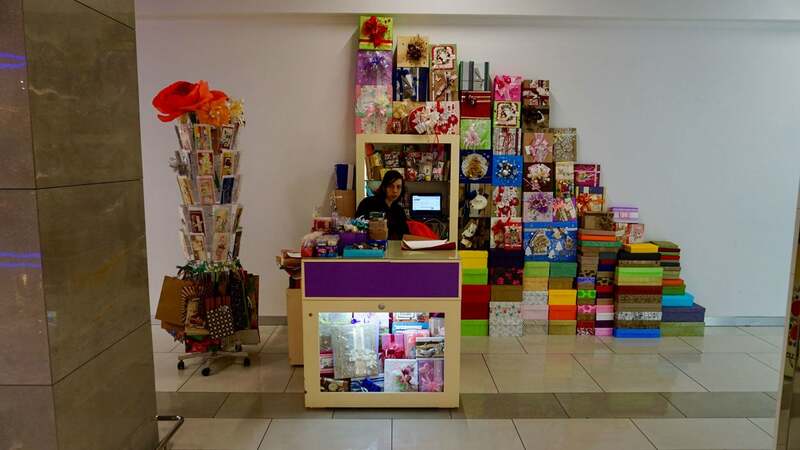 According to a poll by Rating, a sociology group, 59 percent of Ukrainians supported the holiday swap. In 2015, Ukraine’s parliament declared May 8 as the “Day of Remembrance and Reconciliation.” Ukraine now commemorates the Allied victory over Nazi Germany on both May 8, as the United States and Western European countries do, as well as on May 9, as Russia still does, and the Soviet Union did. Ukraine has not only traded away Soviet holidays for its own, but it has also adopted some Western holidays that weren’t typically celebrated during the Soviet years. This year, many bars, restaurants, and clubs in Kyiv had special Halloween parties. There was a Halloween bike ride, motorcycle ride, and even a “zombie walk” in which costumed revelers paraded through the streets whilst sipping on pumpkin tea and munching on trick-or-treat sweets. And a fancy steak restaurant in the city center threw a Stephen King-themed party. Traditionally, all the big TV channels carry the movie on that night, and many families watch it together. Although—as is the habit of young people around the world toward their parents’ traditions—many Ukrainian millennials roll their eyes at the annual “Home Alone” screenings nowadays, having seen the movie a time too many, perhaps. Ukraine’s holiday traditions have become more like those of the United States and other Western countries since the collapse of the Soviet Union in 1991. Some Ukrainian holiday traditions have been appropriated to fit the Western holiday mold. Ukraine’s Santa Claus analogue—Father Frost—was traditionally associated with New Year’s celebrations. Now, at shopping malls in Kyiv, parents can have their children sit on the lap of a man in a Father Frost costume to get their picture taken; a scene pretty much indistinguishable from any Santa Claus Village at an American shopping mall. While many Ukrainians generally embrace such changes, there are some who prefer their country would focus on its own heritage for the sake of distancing itself from Russia. “Every year we are farther away from Russia and closer to the real Ukraine,” Kyrylo Yakovlev, a 23-year-old National Guard war veteran from the eastern Ukrainian city of Kharkiv, told The Daily Signal. Life in the Soviet Union is not a living memory for Ukraine’s millennials. Consequently, their cultural tastes are more malleable than those of the older generations. 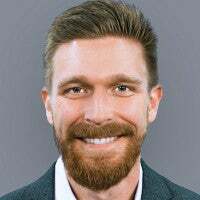 “Ukraine will get rid of the Soviet past and Russian culture, it is a very long but irreversible process,” Oleksandr Toporivskyi, the 27-year-old mayor of the western Ukrainian town of Novovolynsk, told The Daily Signal. Polls indicate a lingering nostalgia for the Soviet Union among a slice of Ukrainian society. In 2016, 34.5 percent of Ukrainians still said they would like to see the Soviet Union reconstituted, according to polling by the Razumkov Center. Yet, polls also suggest that Ukrainians’ overall attitude toward Russia has become more adversarial since the 2014 revolution and war. In September 2013, 88 percent of Ukrainians felt “positively” about Russia, based on a Kyiv International Institute of Sociology poll. In May 2017, that number was down to 44 percent. And the feeling is mutual—just 26 percent of Russians felt “positively” about Ukraine in May 2017, said the Kyiv International Institute of Sociology. Despite the bad blood, Russian and Ukrainian cultures remain intertwined. Many Ukrainians have family and friends living in Russia. Both countries have Slavic cultures with shared historic roots. And Ukraine, like Russia, is a majority Orthodox Christian country. Russian pop culture remains popular in Ukraine. Russian comedy variety shows, for example, are a popular entertainment staple. 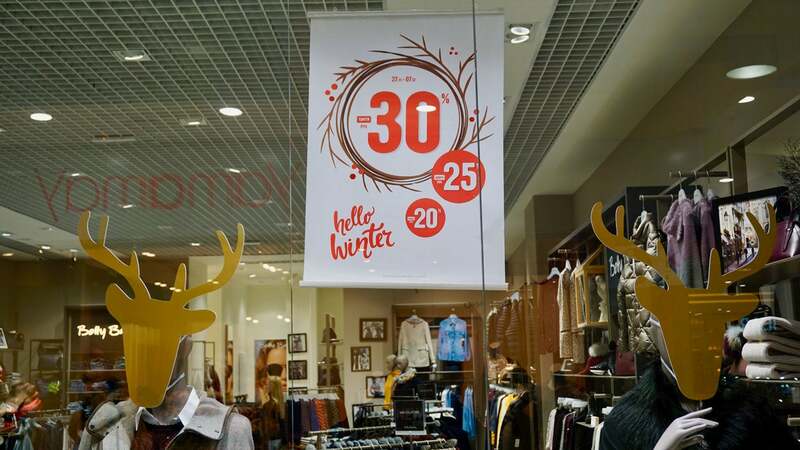 Black Friday sales at a mall in Kyiv. A government ban on Russian social media sites put in place this year remains highly unpopular in Ukraine—58 percent of Ukrainians do not support it, according to a recent poll by the International Republican Institute, a U.S. think tank. Although speaking Ukrainian is on the rise, Russian remains the language of daily conversation in many parts of Ukraine. At universities in Kyiv (which draw students from across the country), students are required to attend classes in Ukrainian. However, they commonly switch over to Russian once they hit the streets and hang out with friends. “Because the first thing uniting us is our families and the language we speak,” she said. Ukraine is unquestionably drifting out of Moscow’s cultural orbit. The question is—when will it reach escape velocity? “About the divorce … nobody knows how it will all end,” Fedotov said.